The 2WD Pilot comes ready to tow up to 2000lbs, but if your towing requirements exceed 2000lbs/200lb tongue weight the ATF Cooler is required. Increase the 2WD towing capacity to 3500LBS/350lb tongue weight. Radiator-style cooler keeps the Automatic Transmission Fluid at peak operating temperature. Designed and tested to the same rigorous Honda standards as the rest of your vehicle. Your vehicle deserves only genuine OEM Honda parts and accessories. 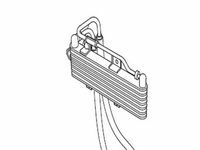 To ensure reliability, purchase Honda part # 06255RN0325 Trailer Hitch ATF Cooler (2WD Trim Only). It is sometimes referred to as Honda Trailer Hitch ATF Cooler. Our Honda parts and accessories are expedited directly from authorized Honda dealers strategically located all across the U.S. and are backed by the manufacturer's 12 month, 12,000 mile warranty. OEM Honda parts are the best for restoring your vehicle to factory condition performance. This part fits specific Honda Pilot models. Affordable, reliable and built to last, Honda part # 06255RN0325 Trailer Hitch ATF Cooler (2WD Trim Only) stands out as the smart option. Honda Parts Now is your prime online source with the biggest and best selection of genuine Honda parts and accessories at giant discounted prices. We have the OEM Honda parts and accessories you need at the lowest possible prices. Honda Parts Now has you covered no matter what type of Honda vehicle you drive.